Seemingly all-American guy Charles Reece (McArthur) goes on a murder spree, killing and then mutiliating his victims. 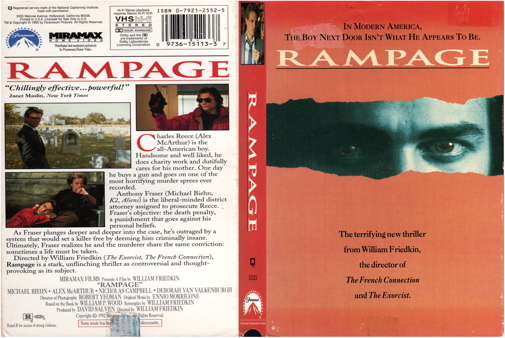 Fraser (Biehn) is a liberal district attorney who questions his own views as he argues during the trial that Reece was sane when he committed the murders and deserves the death penalty. Director Friedkin makes no bones about his concerns that the criminal insanity defense often spares the perpetrator while denying justice to the victims. Adapted from the book by William P. Wood and loosely based on killer Richard Chase. Filmed in 1987, the movie wasn't released until 1992 due to the production company's financial difficulties.